The Hamilton Award was instituted 1910 by the Swedish Kennelclub in memory of the founder of the club and its first chairman, court forester count A.P. Hamilton. 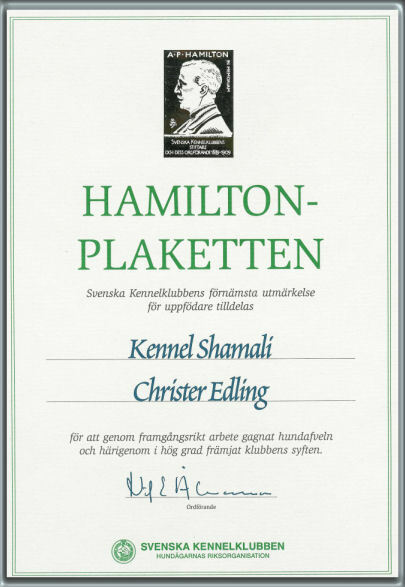 The Hamilton award is The Swedish Kennelclub's most prestigeous mark of distinction for breeders. It is awarded to breeders who, through successful breeding, to a great degree have benefited the object of the Kennelclub. In order to be nominated, the breeder must have had an active breeding for at least 10 years, the breeding work must not contradict SKK:s rules or policy and the recipient's general behaviour towards his/her dogs is taken into consideration. Among Sweden's 12 000 breeders, only a select few are awarded The Hamilton Award every year.